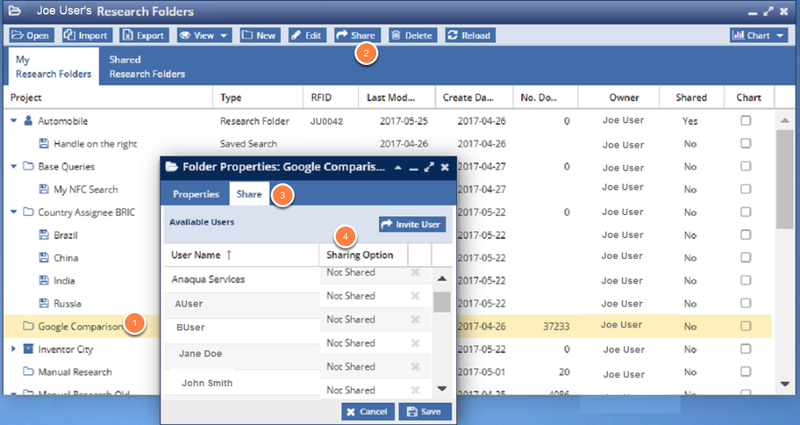 To share a folder, open the research folder window, single-click the folder you want to share, such as the Google Comparison folder (1) in the example above, and click the "Share" button (2). The Folder Properties window will open with the Share tab (3) in focus. The folder will list members on your team with whom you can share folders. Not Shared (shared user will not be able to see the folder). Read Only (shared user can view patents and copy patents to another folder but cannot add or remove patents from your folder). Full Access (shared user can add and delete patents from the folder you share. This will show up as Read/Write to the shared user). Folders you own and share with other users are still shown in the My Research Folders. To differentiate them from unshared folders, they are marked with a "Yes" in the Shared column (1). They are further marked with a little man as the folder icon (2) in the Project column. When others share their folders with you, they appear in their own tab (1). When the Shared Research Folders tab is open, you can see all of the folders that others have shared with you. Notice the Owner column (2) and the Shared column (3). The Owner column will be the person who owns the folder and shared it with you. This is never you, as the Shared Research Folder is only for those folders that others own that have been shared with you. The Shared column will tell you what privileges you have to the folder or search. In the example above, Joe User has both read and write privileges. The other user may revoke those privileges, or change the privilege level that was granted to you, at any time the decide. If this happens, you will not be able to open the folder or run the search. Instead, you will get an Invalid Syntax error.